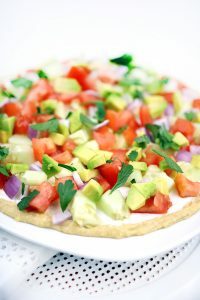 Today I’m sharing a Healthy ‘Get Your Veggies!’ Dip, loaded with fresh tomatoes, onion, cucumbers, avocados, herbs, etc. So delicious, simple and heart healthy! I’m also talking about Nature Made® Omega-3 supplements available at Walmart, their packaging change and how much EPA & DHA you need. Packaging Change? Searching for fish oil at Walmart? Well, it’s actually the EPA & DHA Omega-3s from fish oil that count! Now at Walmart, you can find a selection of Nature Made® Omega-3 supplements that clearly call out the amount of EPA & DHA Omega-3s on the front of the label, which I love! 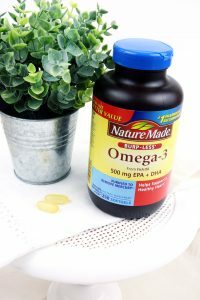 EPA + DHA Omega-3s are the active ingredients in fish oil that provide heart healthy benefits.† With this label change, Walmart has made it easier to navigate the “fish oil” segment and made me feel confident that I’ve found the right Omega-3 supplement. 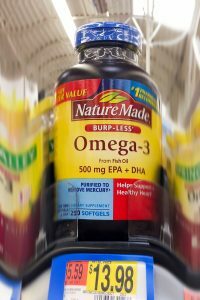 I purchased Nature Made® Omega-3 500mg EPA+DHA, Burp-less supplements from Walmart. Nature Made® offers many “burp-less” Omega-3 supplements! The burp-less formula is specially coated to help prevent a fishy odor and aftertaste. Did you know it is also the #1 Pharmacist recommended vitamin and supplement brand?? * You can text OMEGA to 555888 to check out a quick video from Nature Made® on their Omega-3s at Walmart​. How Much EPA & DHA Do I Need? Heart health experts recommend consuming two servings of fatty fish per week for healthy adults. This equates to approximately 500 mg of EPA + DHA per day.1-2,‡Most people don’t consume this much, including myself. Click on THIS link to see the a video Nature Made® created about Omega-3s! 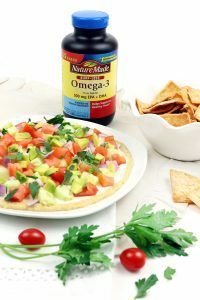 Or you can text OMEGA to 555888 to check out a quick video from Nature Made on their Omegas at Walmart. Do you ever struggle with getting all of your veggies in too? 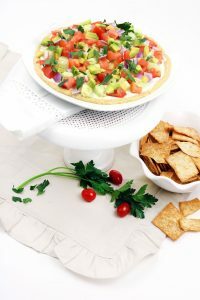 Today, I’m sharing a healthy dip with a humus and low fat Greek yogurt layer on the bottom, and then it is loaded on top with fresh tomatoes, onion, cucumbers, avocados and herbs. 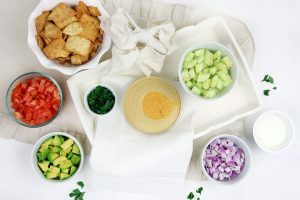 This dip is a simple and heart healthy alternative to other dips and you can enjoy it with pita chips or veggie sticks! 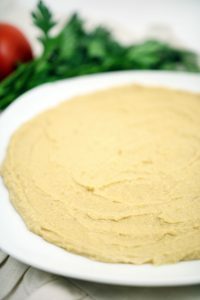 Smooth out the humus over a flat plate. 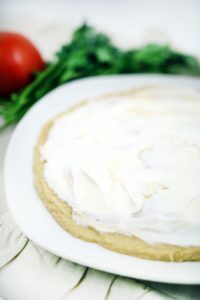 Layer the non-fat Greek yogurt over the hummus layer. Top it with the delicious veggies and sprinkle the fresh parsley on top. 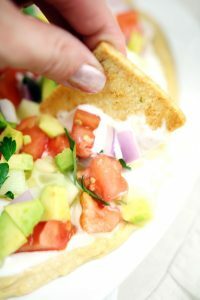 Pita chips or even veggie sticks make great dippers! Yum! Find out more about Nature Made® from Walmart on Facebook, Twitter, Instagram and YouTube. 1. Kris-Etherton PM, Harris WS, Appel LJ. Fish Consumption, fish oil, omega-3 fatty acids and cardiovascular disease. Circulation 2002;106:2747-57. ‡“Recommended amount” equates to a calculation based on approximately 3,500 mg of omega-3 fatty acids EPA/DHA found in two servings of fatty fish per week.